The government will spend 110 million yuan ($16 million) in improving the speed and efficiency of response to major disasters, a senior official has told China Daily. 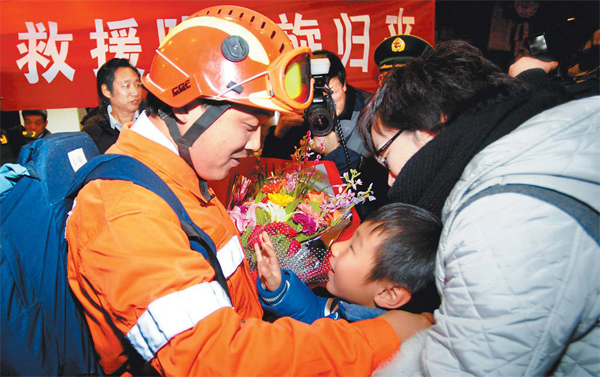 The news comes a day after the China International Search and Rescue team returned to Beijing following almost two weeks of search and rescue operations in Haiti, which was devastated by a 7-magnitude earthquake on Jan 12. "The prediction of earthquakes is a problem for scientists all over the world," said Chen Xuezhong, a researcher at the institute of geophysics under the China Earthquake Administration. 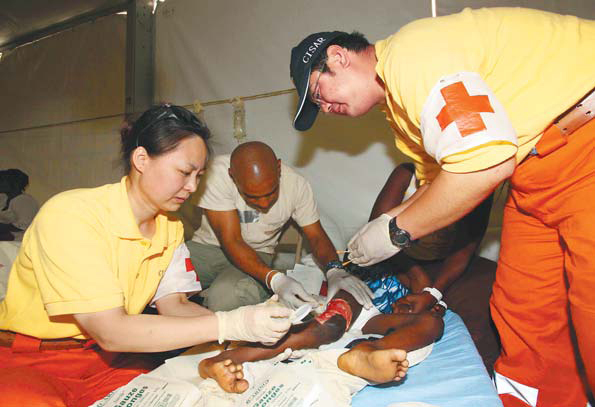 "The rescuers have done a top humanitarian job in Haiti," said Zhao Heping, vice-director of the China Earthquake Administration. He explained that improving disaster prediction and response is vital for the country, which is among the most at risk from earthquakes. Over the past century, the Chinese mainland has been rocked by an average of 20 tremors of 5-maganitude or above each year. In the same period, two 8-magnitude earthquakes struck - in Sichuan province on May 12, 2008, which left more than 87,000 people dead or missing; and Tangshan, Hebei province, in 1976, where more than 242,000 people died. The administration has reported three tremors ranging from 3.4- to 5-magnitude on the mainland this month alone, with the most recent in Shanxi province last Saturday. 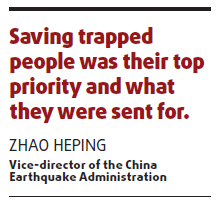 The earthquake that struck Sichuan in 2008 taught the country that it should bolster its professional rescue team and improve coordination of resources, said Zhao. "In Sichuan, the national search and rescue team could only work on two sites at the same time, when there were so many places that badly needed help," he said. "To solve this, we more than doubled the number of team members to 480 last month." The China International Search and Rescue Team has operated with about 220 members since it was established almost a decade ago. However, the 110-million-yuan injection will go towards new technology, while the team is now made up of 370 soldiers and police officers, 60 experts and administration coordinators, and 50 medical professionals. The average age of the team is below 30 years old, while up to 30 members are women, said the official. "The expanded team can now carry out search and rescue activities in three difficult and complex settings in urban areas, or six different urban sites of average difficulty," he said. "They are also capable of operating simultaneously on nine sites in collapsed structures in the countryside." The Chinese team passed the strictest tests set by the United Nation's International Search and Rescue Advisory Group last November and is ranked one of only 12 heavy urban rescue teams in the world. Singapore is the only other nation in Asia to receive the certification, which recognizes that the team has the operational capability for difficult and complex technical search and rescue operations in areas where structures have collapsed, said Zhao. Zhao said the qualification has boosted the capability of the national team and, in a bid to disseminate expertise and experience, his administration is considering classifying rescue teams at provincial, city or county levels. The country has 27 provincial search and rescue teams, comprising of almost 5,000 members. Several provinces have yet to build teams, he said, declining to elaborate. To train staff, China spent about 210 million yuan on the National Earthquake Rescue Training Base in Beijing. It opened in 2008 and at least 200 members from 18 provincial teams have been trained there, said Zhao. About 120 more were sent to train in Singapore. Provincial bases are also planned for Chengdu, capital of Sichuan, and Lanzhou in Gansu province at a combined cost of 150 million yuan, he said. The nation's earthquake emergency response plan will also be updated to include the lessons learned about on-site coordination and communication, he added. Work on the response plan began in 1989, shortly after an earthquake in Yunnan province that killed 743 people. It was formally released in 2006. The Chinese rescuers who returned after 12 days of danger and devastation in Haiti yesterday will be hoping their services are not required again any time soon. As he walked out into the terminal building toward a throng of cheering relatives at Beijing Capital International Airport, Huang Jianfa let out an audible sigh of relief. "We're exhausted," Huang, who led China's rescue team to the Caribbean nation, told China Daily. "It took us more than 20 hours to fly to Haiti, and when we got there we worked for almost 90 hours without rest. Now we're back safely all I want is to see my family." Huang, 45, arrived home to flowers and cheers of joy, scenes far removed from the blood and screams of pain he left behind in Haiti, which has been hit by outbreaks of looting and violence since it was rocked by the earthquake. "Haiti was a big challenge for the team. We were the fourth team to arrive from across the world," said Wang Zhiqiu, 44, deputy team leader, who arrived with his colleagues on the chartered China Eastern Airlines flight at 7:19 am yesterday. Despite most members having vast experience of helping after large disasters in their homeland, in Haiti the team had to overcome problems it had never encountered before, such as serious security concerns and poor communication between the multinational relief workers, he said. "Local people are just grabbing food wherever they can. The situation is very bad. It was highly dangerous for us to go to some crowded places during our rescue work," said Wang. "There were also too many rescue teams gathered there. Unlike the relief work that followed the Wenchuan earthquake in 2008, communication in Haiti was very poor and made the coordination more complicated." Huang, who is also director-general of the department of earthquake disaster and emergency management under the China Earthquake Administration, said the Chinese team was forced to cancel all search missions at night when it became too dangerous. "That is my only regret about this trip. Mostly I was deeply impressed by the passion our team members showed," said Huang. None of the Chinese rescue workers suffered injury, thanks in part to the protection offered by UN anti-riot peacekeepers, he said. "But in certain areas it was dangerous and we had to retreat quickly once we had confirmed there was no possibility of finding anyone alive." China's rescue efforts in the poverty-stricken Caribbean nation began just 33 hours after the disaster. The team won plaudits at home and abroad, including from UN Development Program Resident Representative in China, Khalid Malik, who said they did "an excellent job". About 132 people have so far been rescued from beneath the rubble of destroyed buildings by rescue teams, according to UN Office for the Coordination of Humanitarian Affairs. The Chinese team, one of about 60 sent by nations across the globe, was made up of 25 rescuers, 15 medical professionals and 10 seismological specialists. Workers were unable to find anyone alive but did recover at least 20 bodies, including those of the Chinese peacekeepers. The team also offered medical treatment to at least 2,500 people, said earthquake administration chief Zhao Heping. "Saving trapped people was their top priority and what they were sent for. If a team successfully rescues a victim, it is always delightful. But that isn't the only barometer to gauge whether a team is successful or not," he said. Finding the remains of the peacekeepers so that they could be flown home to their families was the team's biggest challenge, said rescuer Wang. "We are a rescue team whose task is to find the living, but this time we had to find both the living and dead buried beneath the rubble." Rescue workers were eventually able to pinpoint which room the peacekeepers had been in and found all eight bodies within two days. They also found the bodies of 19 other victims, including the director and deputy director of the local UN office. However, Wang said the Chinese team was upset by reports they saw in the Western media that criticized them for focusing only on Chinese nationals and ignoring others in Haiti. "One reporter was on the site (of the collapsed UN building). We were busy with the work and so were a bit rude to him. Actually, the first and second bodies we found were both not Chinese victims but we did not announce it. The reports did not reflect the facts," he said. The UN announced last Saturday that Haiti's government had declared the search for survivors of the earthquake over, with hope fading for those still lost in the rubble. "The focus has now been shifted squarely to providing shelter and medical treatment," said Zhao, who added that the Chinese team left some equipment to be used by others. Almost 160 workers arrived on the flight MU599 to Beijing yesterday, along with about 50 Chinese stranded in Haiti, three sniffer dogs and 5 tons of rescue equipment. The outbound journey to Port-au-Prince - which made stopovers in Canada, and Jamaica - was the first time China Eastern Airlines had flown to Haiti. "We had to land on the lawn at Haiti airport because the narrow strip was crowded with tents, United States forces equipment and helicopters. Our plane was the only commercial plane there," captain Fan Ru, the pilot of flight MU599, told China Daily. Now 26, Li is a blind masseur in Beijing's Chaoyang district and says he is still looking for hope in his life. Actress and cast member Katie Holmes arrives for the premiere of the film "The Extra Man" at the Sundance Film Festival in Park City, Utah January 25, 2010. Model Heidi Klum alias Heidi Samiel unveils her wax figure at Madame Tussaud's in Berlin, Germany. We often mention desire to become innovative in China and stop relying on west for technology. Saying is easy than done. I must said China has make some success in the last few years. How corrupt and unsportsmanlike is soccer?